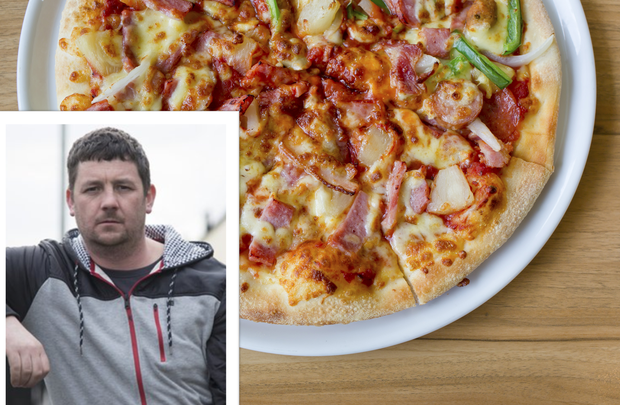 Blog: Why is there so much disgust over Love/Hate Aido's ham and pineapple pizza? RTÉ drama Love/Hate has taught me a lot of things down through the years. Borrowing wads of hundred quid notes from men who travel around Dublin surrounded by burly henchmen, for example, is probably not advisable. Any invites to take scenic walks through the Wicklow mountains are best declined and if you’re a real Garda who decides to star as a fictional Garda, you might want to inform the old boss before signing the X on the line. During last night’s Love/Hate, however, I learned my biggest lesson yet. If you’re going to have a ham and pineapple pizza, you’d best be doing it in safe house. In the latest instalment of the fifth season, Aido, one of Nidge’s aforementioned burly henchmen, did what many of us do after a night on the tear. The poor crator ordered himself a pizza. But it wasn’t Aido’s choice of takeaway that got the public riled, for sympathy can be summoned for even the baddest of baddies when hangovers from hell are concerned. No, it was his decision to adorn his pizza with ham and pineapple that had the Twittersphere up in arms. ‘What kind of sick animal gets pineapple on a pizza,’ tweeted Nicola Byrne. ‘Aido has pineapple on his pizza. He is dead to me,’ tweeted Paul Reid. Tweeter David Flynn even suggested the most gruesome part of the show was the delivery of Aido’s seemingly questionable pizza of choice. The influx of hostile tweets aimed towards the unsuspecting pizza combo, frequently christened the Hawaiian, flooded my Twitter feed as clearly I follow a mixture of regular takeaway indulgers with a soft spot for bloody gangland drama. I feel almost as brave Garda informant Siobhan by admitting this. Like Aido I too am fond of pizzas topped with the unspeakable. I am a fan of ham and pineapple. In this month’s issue of Observer Food Monthly, Jay Raynor wrote of his recent experience on BBC 4’s Saturday Live where he was recruited to relay his expert advice on how to achieve the perfect cheese on toast. Raynor was then subjected to a wave of outraged texters and tweeters who couldn’t believe he would add bacon to CHEESE ON TOAST! Sacrilege, altogether. Can you even believe the cheek? Raynor came to the conclusion that when it comes to eating bold things, especially things that would have foodie friends turn their noses up instantaneously, it is probably best to do it in secret. But that doesn’t fly with me. For years, I’ve watched people eat disgusting things and I’ve refrained from judging them, knowing I have some pretty gross comfort food concoctions up my own sleeves. I’ve watched (and even tried) a pot noodle sandwich, the piece de resistance of one college friend and to be honest it wasn’t the worst thing in the world. I sometimes watch my dad pour brown sauce over a beautiful roast dinner I’ve slaved over, but unlike my mom who can’t understand it, it doesn’t bother me. If brown sauce is what he wants, I don’t see why I should give out about it. Why do we feel the need to be outraged about what other people eat? I never thought I’d have something in common with Aido, but it seems we share a comfort food, and who cares? Next Sunday evening, if I’m feeling delicate I might even indulge in a ham and pineapple pizza myself while watching Love/Hate. When it comes to what other people eat, especially something as mundane as a pizza, it's bizarre that it even summons an interest. Perhaps because I'm a glutton, I've never really felt much guilt when it comes to indulging myself in my odd favourite things. One thing is for sure though. If was Twitter was Nidge’s world this public pizza confession would be enough to have me clipped.